Enhance every dining experience by choosing from our luxury table linens. With a wide range of linen quality and design choices you are sure to find the perfect linens to suit your requirements. Choose a beautiful luxury linen tablecloth and co-ordinate with some of our linen napkins, linen placemats and linen runners and you are sure to impress guests. 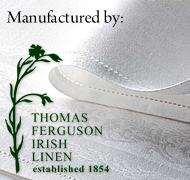 Our luxury Irish table linen will last a lifetime of normal domestic use. Features an open mesh weave design made from a heavy coarse fabric resulting in a wonderful rustic traditional effect. Available in white or natural at a wonderfully afforadable price. Ideal for casual dining. This highly versatile hemstitched plain table linen is a popular choice. It is suitable for both formal and casual dining. It is highly affordable and makes an excellent gift as it’s subtlety suits most tastes. Available in White or Natural. (84 threads per sq. inch) As this collection is made to order please allow 4 weeks for delivery. This fine plain weave, inexpensive Irish linen, makes an ideal gift. As this collection is made to order please allow 4 weeks for delivery. Linen damask makes exceptionally high quality table linen.Linen Damask drapes beautifully and will flatter any dining room.It carries all the unique characteristics of an Irish Linen tablecloth, and is offered in a wide range of standard designs. Threads 160 per sq.inch / 63 per sq.cm. Weight 5.96 oz per sq.yd / 210 gms per sq.m. Please note that the Satin Band Design is only available in white. Tomary House Irish Linen Damask combines fine, high quality yarns, dense weave and intricate designs to create a superb cloth, magnificent to touch and beautiful to look at. Tomary House Irish Linen Damask combines fine, high quality yarns, dense weave and intricate designs to create a superb cloth, magnificent to touch and beautiful to look at. Please note this collection is made to order so delivery will be 3-4 weeks. Irish linen double damask is the ulimate and most exclusive fine table linen.This double damask Irish Linen is offered in a wide range of standard designs. Threads 202 per sq.inch / 80 per sq.cm. Weight6.25oz per sq.yd / 220 gms per sq.m. This is the finest quality Linen Damask being woven in the world today. Over 230 threads are tightly woven into every square inch, resulting in the superb definition of the ‘Classic’ design, and wonderful natural lustre from this cloth. This is the ultimate table linen.